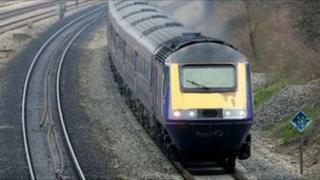 FirstGroup's First Great Western train company will keep the franchise to run trains into Wales and the South West for another two years. The Department for Transport said it would last until September 2015. FirstGroup was expected to be told it could keep the franchise, but the term was expected to last until July 2016. Passengers have been told they can expect greater seating and sleeper carriage capacity, as well as an improved wi-fi connection. The Transport Secretary, Patrick McLoughlin, said: "For communities like Devon and Cornwall the train is a lifeline bringing in business and helping secure the leisure industry the community relies upon. This agreement will provide additional sleeper carriages between London and Cornwall securing the future of a key service once under threat." He also said the new franchise would see more standard class and fewer first class seats on key services, as well as the delivery of more electric trains for the Thames Valley. The government's awarding of longer-term rail franchises ran into trouble last year after it admitted there had been "significant technical flaws" in the tendering process for the West Cost Main Line, which were originally given to FirstGroup. Mistakes made by the Department for Transport staff lead to three civil servants being suspended and the longer-term franchise deals delayed. Originally, First Group had three competitors for the Great Western Lines, including Stagecoach, Arriva and National Express. FirstGroup was left as the only commercial candidate being considered. There had been concerns in some quarters that a short extension of the franchise, rather than the 15-year length originally planned, would mean a delay to running time improvements and internet access on board. Welsh Secretary David Jones said the announcement would ensure continuity for passengers. "The assurance of improved services, such as the roll out of wi-fi, will also be warmly welcomed," he said. "Our programme, which we announced last year, of electrification if the main line from London to Swansea, and the Cardiff Valley lines, will remain on target."